80 days. Solanum lycopersicum. Open Pollinated. 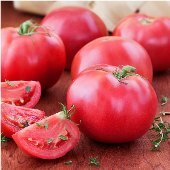 Plant produces good yields of 8 to 10 oz dark pink tomatoes. It has the rich old-fashioned tomato flavor. They tend to ripen at the same time making it a great variety for canning and freezing. Also great for sandwiches, salads, and slicing. Plant requires support, either staking or cages. Crack resistant. Suitable for Southern regions. Excellent choice for home gardens and market growers. A heirloom variety developed in 1961 by Dr Joe McFerran of the University of Arkansas, Arkansas, USA. United States Department of Agriculture, PI 644845. Disease Resistant: F, A. Determinate. These tomatoes have some good old fashioned flavor and they produce well in my hot, humid Southern garden. Good disease resistance, too.